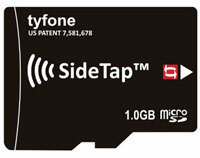 Tyfone has been awarded a new patent for its mobile wallet platform. The patented technology, Mobile phone with electronic transaction card, enables the use of a mobile phone to transmit transaction data to a reader device via an NFC-enabled memory card. The memory card includes circuitry used to produce a time-varying magnetic field that enables a contactless transaction. Tyfone’s mobile wallet platform features the SideTap neutral secure element, which enables users to manage multiple consumer credit, debit, pre-paid, loyalty, identification,and transportation accounts for use in payment and other secure transactions. According to Tyfone, analysts are forecasting contactless payment transactions via microSD technology will be used by more than 20 million people in North America alone over the next two years. Additionally, Juniper Research has predicted that the global gross transaction value of mobile contactless payments is expected to exceed $30 billion by 2012.